With a college degree in modelmaking and varied work experience, I struck out on my own in 1987 designing and building architectural models, prototypes and exhibits. Occasionally I would accept commissions for custom furniture. I found that I liked designing and building one-of-a-kind pieces. Eventually the challenges of design and a reverence for beautiful wood ignited my passion for furniture making. The common themes linking my work are uniqueness of design, commitment to high quality, and attention to detail. 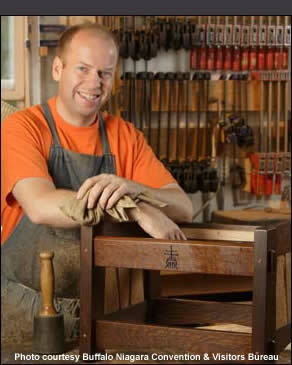 As a Roycroft Master Artisan, my first-love is Arts & Crafts style. I like to think of my original designs as "Arts & Crafts style for the 21st century." Without limiting the designs, my work varies in style from traditional to contemporary. Upon completion, each piece is signed, dated and the Roycroft Renaissance Mark added. My goal has been, and continues to be, to design and build the highest quality furniture to suit your specific needs. Each piece is created individually, taking as much time as necessary in the attempt to achieve perfection. With your help I can create an heirloom that will reward you each time you use it. Roycroft founder, Elbert Hubbard said, "Blessed is that man who has found his work." I truly consider myself blessed.